If you are interested in streaming your favorite shows and videos with the lights dimmed, TV Time is not an application you should consider installing. Even though the program seems to offer great services, it runs as an advertisement-supported program, and there is no doubt that the promoted services is just bait for Windows users. Needless to say, we do not recommend installing the application from its official website downloadtvtime.com. Have you downloaded it already? In that case, we recommend removing TV Time, and our removal tips will help you! TV Time is a clone of Movie Mode, another advertisement-supported program that requires removal. Our researchers indicate that the program works similarly to Meteoroids, Blasteroids, Zombie Alert, and plenty of other applications that you should delete as well. TV Time has been developed by Ratio Applications, and it appears that this is just a different name presenting the same software developers. Other names include Time Lapse Solutions, Acute Angle Solutions, and Creative Island Media. If you find that apps running on your PC have been developed by these companies, you may have to delete them. Not all computer users will download TV Time from its official page. In fact, we believe that most users will accept the offer to install the program when downloading other applications. You have to be extra cautious about software bundles, because they might be used to spread unreliable software as well. Even TV Time itself could be installed with even more intrusive applications. 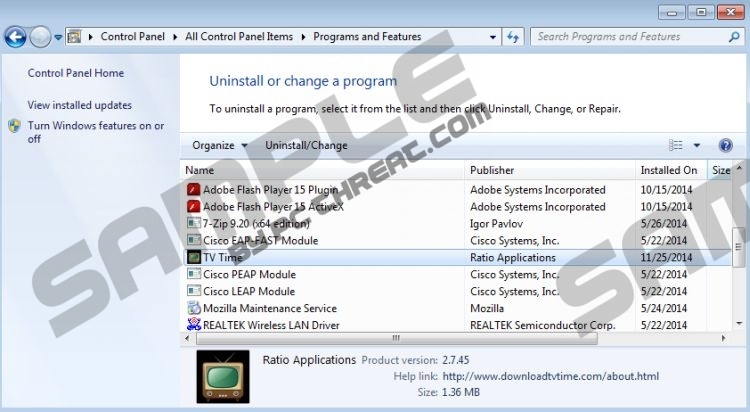 Do you believe that none of the installed programs require removal? Employ a malware scanner to help you inspect your operating system and find out if any of the running applications should be deleted. Of course, you need to remove all of the detected threats. Once installed, TV Time should display ads periodically. While most advertisement-supported programs show ads sporadically and unpredictably, TV Time may release ads in certain time intervals. Overall, it does not matter what kind of offers you are presented with, which form is used (e.g., pop-ups or banner ads), or how often they show up. It is most important that you delete TV Time. The ads are truly unpredictable, and they could promote useless, bogus, or malicious products. If you have downloaded TV Time without any other programs attached to it, you may be able to delete the application manually. On the other hand, you should consider installing reliable security software if other threats are active. A legitimate security tool will not only reinstate Windows protection, but will also automatically delete TV Time together with other running threats. Open the Start menu by clicking the Windows logo on the Task Bar. Click the Start button on the Task Bar and a user menu will show up. In the Change or Remove Programs menu select and Remove TV Time. Quick & tested solution for TV Time removal.